One thing I like about my job, is how exciting and interesting it can be from day to day! I come across some pretty bizarre and crazy bee stories. Honey Bees Evicted from Rental Property in Macon, Georgia! 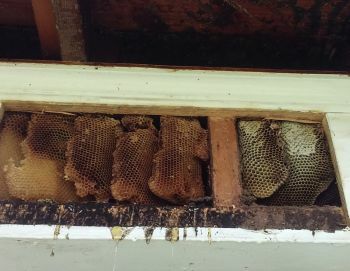 A tenant was moving into this home in a week and the landlord needed the hive of honey bees removed asap. It turns out, honey bees do not care about paying rent! So he gave them their eviction notice and called Southeast Bee Removal. Here is a unique story of a bee removal I did, both becuase of the size of the swarm and because it involved an answer to prayer that I am going to tell you about. Southeast Bee Removal has a goal of providing the best possible bee removal service at the best possible rates. For the quality of work performed we believe you are getting the best value for your money when you hire us! A typical honey bee floor joist removal. We removed the entire colony of bees including the comb and honey, sealed the entry point, and repaired the drywall with the first coat of mud. Here is an account of the oldest honey bee colony I have ever heard of, located in Rutledge, GA about 45 minutes east of Atlanta. "My family's ancestral home has had honeybees in the front corner of the porch and half-column against the wall of the house for as long as I can remember and I am 67 years old. My grandmother was born in the house in 1880 and she told us the bees were there when she was a child. I also grew up there and remember several times when my parents had local beekeepers try to remove the bees without success. I know they finally let the exterminator try, but even then, the bees came back." The beam that supported the porch roof was filled with dripping honey comb! 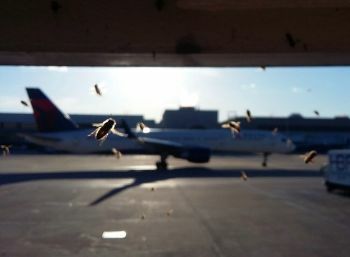 Honeybees Come in for a Landing at the Atlanta Airport! A plane is forced to change gates to allow honey bees to come in for a landing! Who would of thought that small tiny honey bees could reroute a huge plane loaded with passengers? Yet this is what happened, a swarm of 15,000 honey bees landed on the jetway where passengers normally unload. Airport officials, not wanting to take a chance with the bees potentially stinging passengers as they unloaded, decided to reroute the planes until the bees could be removed. This is a honey bee removal job I recently did in Augusta GA. I was amazed at how many dead bees were on the floor and window of the room. There literally could have been 10,000 or more dead bees. The ceiling had a softball sized hole where the bees could get through. Since bees are attracted to the light, they were flying to the window thinking it was an exit point. Once seperated from the hive and in the confined space of the room, the bees died quickly. 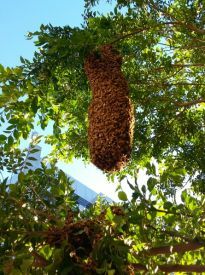 Just outside the Aqua Midtown Condos in downtown Atlanta, a large mass of honey bees were all clinging together 20 feet up in a tree, about 15,000 of them. Now how they got there seems somewhat of a mystery. Surrounded with tall buildings and busy streets the area does not look like an ideal living situation for the bees. 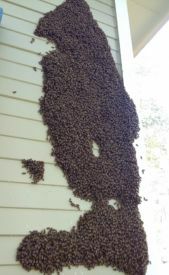 Southeast Bee Removal encountered a strange sight when called upon to remove a swarm of honeybees from a house in Macon Georgia. The 25,000 bees had swarmed into a solid wall formation of approximately two feet by five feet and two inches thick. The formation in the picture below is how the bees looked when I arrived! Bees at Atlanta Braves 2017 Stadium?! 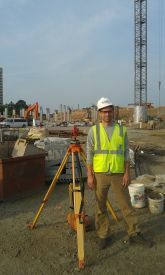 Joshua got a call from the Atlanta Braves 2017 Stadium, they had found honey bees at the construction site. Joshua went and did a bee inspection, then afterward was given a tour of the new Atlanta Braves Stadium, set to be finished in 2017! How cool and fun!